Robert Emmet denied the French three times, twice in his speech from the dock and once from the gallows. His rejection of the French remains the most controversial and disputed aspect of his entire life. Only a close examination of the trial of Robert Emmet puts some of these problems into focus. The speech from the dock ensured Emmet’s immortality. It was widely reproduced in the nineteenth and twentieth centuries, and quickly reached an international audience. However, there has never been any agreement about what was actually said. What becomes clear is that the version of the speech that we use reflects the version of the truth that we want to project. In the early 1980s Norman Vance published a compelling and provocative article in which he even speculated that Emmet might never have said the famous final lines about his epitaph. Vance was using the official version of the trial, produced by the government from the notes of William Ridgeway, an experienced courtroom reporter. Marianne Elliott developed the Vance thesis in her ground-breaking work Partners in revolution. Twenty years on, there is now little controversy over the disputed final lines. Emmet’s twenty-first-century biographers now accept, on balance, that he probably did deliver the traditional ending. The lines appear in a number of contemporary publications, and there is little real reason to doubt them. However, a new controversy revolves around the remainder of the speech. At last count there are over seventy different versions of the text, but most of these are later reworkings and have little claim to acceptance. The speech from the dock is central to understanding Emmet as it encapsulates so many of the concerns and issues about his life and insurrection. For example, one of the most striking things about the Madden version of the speech, perhaps the dominant account in the historiography, is just how anti-French it is. This seems remarkable—that Emmet, in his final chance to address the Irish nation, should choose to launch a pre-emptive attack on his supposed allies. In Emmet’s famous final letter, to the chief secretary, William Wickham, he revealed that had he been allowed to finish the speech he had intended, he would have praised the government for its leniency in general and its kindness to him in particular. Emmet believed that the post-Union administration in Ireland was remarkably mild. But this, in his own words, only accelerated his plans for a rebellion. He was determined to politicise the Irish people against the Union and establish an independent Irish republic. It was the principle of British rule he rejected, not the practice. While in Paris, Emmet had heated debates with Napoleon about the Union—Napoleon believed that the fact that it had passed without too much public opposition showed that the Irish had embraced their role in the British empire and would be less willing to fight for their independence. Emmet rejected this, but it was something that gave him cause for concern. He was afraid that if the Irish administration continued to rule with mildness, then the Union would be accepted generally, and Napoleon would be proved correct. The anti-French sentiments in the speech from the dock horrified the French when it was published in Paris some weeks later. There were insinuations that the British government had doctored the text, inventing some passages, and this belief has persisted to the present day. We have good primary sources for Emmet’s views on the French. Catherine Wilmot, the Irishwoman who knew him in Paris, revealed that he disliked French company and preferred to dine with English and Irish visitors. Miles Byrne has references in his memoirs to Emmet’s fears about the new French imperialism. And even in the love letters of Sarah Curran there are passages about a possible French invasion—she asks Robert if he still feels that if the French land the Irish will be worse off than before. We know that in Paris Emmet and Russell had heated arguments with some other United Irishmen about the question of French aid, and whether the French could be trusted. Later, Thomas Addis Emmet would declare that Napoleon was the worst enemy Ireland ever had. All of this provides a clear enough picture of Robert’s feelings about the French. He was prepared to accept them as allies, but was very clear that aid would only be accepted on the same terms as had been given to the Americans in 1778. That was why, in the summer of 1803, he sent his brother to Paris to negotiate with Napoleon about drafting a similar treaty to that signed by Benjamin Franklin in 1778 which brought France into America’s War of Independence. No matter how thorough we try to be, there is no way of proving with absolute certainty what Emmet actually said in the courtroom on the evening of 19 September 1803. But we can make some shrewd guesses based on the available evidence. It is reasonable to assume that the most accurate versions are those published soon after the trial; the further away from 1803, the greater the risk of inexactitude, exaggeration and error. There are two main versions worthy of detailed study. The first is the Madden version, which, although published much later, was drawn almost entirely from a contemporary account taken by a stenographer, John Angell. Angell was the son of a celebrated author on stenography, and his version was published in 1803 at the request of Emmet’s friends. Madden deleted some sections that he believed were invented, and included some additional ones that he had heard from eyewitnesses. This has been described as the ‘patriotic’ version. The second version is by William Ridgeway. This is the government or ‘official’ account, and it was used by many of the newspapers in 1803. For those interested in examining the different texts the website www.emmet1803.com contains the most important versions. One version which is included is a text labelled as having been published by Emmet’s friends. However, this version can be quickly discarded from serious consideration. Not only is it virtually unreadable, but—more importantly—it is unsayable, and if Emmet had attempted to deliver this speech then it would have been unlikely to have had the same extraordinary impact. I stand here a conspirator—as one engaged in a conspiracy for the overthrow of the British government in Ireland; —for the fact of which I am to suffer by the law; —for the motives of which I am to answer to God. —I am ready to do both. —Was it only the fact of treason—was it that naked fact alone with which I stood charged —Was I to suffer no other punishment, than the death of the body, I would not obtrude on your attention, but having received the sentence, I would bow my neck in silence to the stroke . . . Not, my lords, that I have much to demand from you, —It is a claim on your memory, rather than on your candour, that I am making. This is powerful stuff, and is notable for the strength of the rhetoric. If this section was invented, then what was the purpose? Why put words into Emmet’s mouth, to make him appear more eloquent? Compare Emmet’s bold declaration in the Ridgeway version: ‘I well know, that when a man enters into a conspiracy, he has not only to combat against the difficulties of fortune, but to contend with the still more insurmountable obstacles of prejudice’. And compare this with the bland expression in Madden: ‘A man in my situation has not only to encounter the difficulties of fortune, but also the difficulties of prejudice’. If the Ridgeway version is a fake, then it is one of those rare occasions when the fake is superior to the original. Ironically, then, the ‘patriotic’ version is less patriotic than the ‘official’ version! In both texts Emmet rebuts the charge that he was an emissary of France. In the Madden version he says that ‘there then was’ (past tense) an agent in Paris negotiating with the French to sign a treaty similar to that ‘which Franklin obtained for America’. In Ridgeway the agent is ‘a new agent’ (present tense) who was negotiating to sign a treaty ‘similar to that which Franklin obtained for America’. Since Thomas Addis Emmet was that agent, and since he was indeed in Paris at that moment negotiating, this is a further point in Ridgeway’s favour. Incidentally, in both versions there are strong anti-French sentiments; indeed, they seem stronger in Madden’s version, which goes against the argument that they were invented afterwards to create trouble. If, then, the anti-French lines are genuine, and I have no doubt that they are, then why did Emmet do it? Why alienate the French, because he must have known the speech would reach Paris and be translated? If Emmet was expecting the French to land, in three weeks, as some have suggested, or in three months, or in three years, then he was exceptionally stupid. Now Emmet did indeed do many foolish things, but this seems too naive, even for him. One explanation is that Emmet knew exactly what he was doing. He had wanted to lead a surprise attack against British rule in Ireland—it was to be a coup d’état, with Irishmen doing the fighting and securing their own liberty. The French would only be invited to land once the country was in the hands of Irishmen; they would assist in preserving what had already been won against British attempts to reassert control. But they would not fight the initial campaign. Now that the rebellion had been attempted, and now that it had failed, Emmet had no further need of the French. He no longer wanted them to land, recognising that they would be only interested in plunder. The French could only be controlled if the key strategic locations were already in the hands of Irishmen. Emmet was quite deliberately setting out to alienate the French, to make sure that they did not land in the short term and to damage future attempts to get them to land in the long term. He had lost the battle and was now determined to end the war. If Emmet was expecting a French landing in three weeks, as he supposedly told Leonard MacNally a few hours after his trial ended, then he was insane. Marianne Elliott has ended that debate by proving conclusively that the French were months away from preparing an invasion force, and since then nothing has been found in the French archives to challenge her conclusions. Leonard MacNally was a government spy, and he deliberately invented things Emmet said to him to justify his own payments. Once Emmet was dead there was no one to dispute his version, and it is another irony that the major source in the patriotic account is a government spy who betrayed Emmet on every other occasion. One of the key documents being emphasised in this bicentenary year is the Proclamation of the Provisional Government. 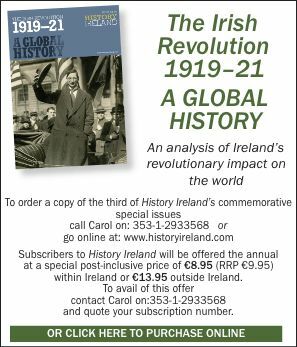 This has been reprinted by Folens Press and sent to every school in the Republic, where it is hoped that it will hang beside the 1916 Proclamation. In the blurb prepared by the Emmet 200 group they claim that it contains ideas and principles later to be found in the Geneva Convention. And Seán Ó Brádaigh, in his recently published short account of Emmet’s life, Bold Robert Emmet, has argued that it contains ‘a moral framework’ for those ‘unfortunate but sometimes necessary events in human life’. Emmet produced about 10,000 copies on 23 July 1803, but the government took great care to suppress and destroy them immediately afterwards, and only two are extant. At his trial Emmet made no attempt to defend himself—indeed, he only allowed his lawyers to cross-examine in order to protect other conspirators or to correct inaccurate testimony. But he was keen to have the Proclamation of the Provisional Government read out in open court—it expressed his views on the rebellion, and emphasised his humanitarian concerns about the treatment of prisoners and the conduct of the republican government. It was an incendiary document, and Dublin Castle made every effort to suppress it at the trial. Emmet’s request to have it read was rejected by the court. Yet if we look at the Ridgeway version of the trial, we see a paragraph—in fact an entire section—that does not appear in any other contemporary account. In this paragraph Emmet skilfully weaves direct quotations and paraphrased lines from the Proclamation into his speech. He refers to the actions of the past eight months, the attempt to wrest power from England ‘with their own hands’. He discusses the extensive military regulations and the point that foreign assistance was not ‘the foundation of the present exertion’. The only similar section in the Madden version is in a later section. And this is an entirely different point, from much later in the speech after Norbury’s first interruption, about his opposition to ‘barbarity, debasement and foreign oppression’. It was certainly not in the interests of Dublin Castle to have Ridgeway invent a section about the Proclamation after they had gone to so much trouble to suppress it. It seems evident, therefore, that the only sensible conclusion is that Ridgeway is the most precise version of the speech from the dock, at least for the first half of the oration. How, then, does one reconcile this with the fact that Ridgeway does not include the famous last lines? This stems from the problems caused by Norbury’s interruptions. Norbury interrupted Emmet six times in the Madden version, three times in Ridgeway, but whatever the number, Emmet was obliged to discard the ideas he had wanted to express—most notably about his lenient treatment—and instead was forced into a spontaneous defence of his right to speak, as well as of his character. Ridgeway transcribes Norbury’s comments precisely, but suddenly his account of Emmet’s defence is markedly different. Instead of flowing, complete sentences and paragraphs, there are now extensive dashes, eleven in one paragraph alone. Emmet’s section about his epitaph is disjointed, and the peroration, as others have noted, is in a clumsy, staccato style. Norbury makes some comments and Emmet attempts one final interjection, with a few lines about France and how he became involved in the rebellion. It is an anti-climatic and very downbeat ending to the oration. In oratory, there are two parts of a speech that really matter—the opening few minutes and the closing few minutes. The rest just reinforces the impression that has already been made. None of the government eyewitnesses or hostile journalists present made any reference to Emmet ending his speech weakly—in fact they testify to the exact opposite. It seems, then, that once Norbury interrupted for the first time Ridgeway put down his pen, and from then on only took general notes of the remaining contributions from Emmet—either that or he chose not to write up his notes for the final half of the speech. Piecing together the final section of the speech is therefore impossible—it becomes a matter of guesswork, not forensics. Some of the lines in Ridgeway are powerful and eloquent and perhaps should be included. In my biography I chose to use the first half of Ridgeway and the second half of Madden, which is a bit of a fudge but perhaps a necessary one. The trial of Robert Emmet is the most important document for understanding his character and the events of 1803. The transcript of the entire trial, and not just the speech from the dock, is crucial for piecing together the gaps in the Emmet biography. For example, in a few instances Emmet had his defence team ask questions that were to be understood as coming from him directly. He wanted it to be put on the record that when he read the Proclamation of the Provisional Government out loud at the Thomas Street depot it was jeered by some of the men, who disapproved of the lenient sentiments. There are other brilliant gems in the transcript, but this one alone is very glaring. It demonstrates the problem that Emmet faced as soon as the men took to the streets armed for fighting: that it is very easy to prepare complex plans for seizing strategic locations in Dublin, and crafting proclamations decades ahead of their time with instructions about the treatment of prisoners, the behaviour of troops and demands for discipline, but it is quite another thing to get the masses to follow them. Emmet abandoned the rebellion before the killing of Kilwarden: it was something which disgusted him and he admitted that he would have tried to prevent it if he had still been around. But by then the rebellion was spinning out of control, and the gap between rhetoric and reality was becoming all too apparent. At the end of the day it seems that W.B. Yeats was correct and that Emmet did understand everything except human nature. Patrick M. Geoghegan is a lecturer in the Department of Modern History, Trinity College, Dublin. P.M. Geoghegan, Robert Emmet: a life (Dublin, 2002). N. Vance, ‘Text and tradition: Robert Emmet’s speech from the dock’, Studies 71 (1982).